Born to allow milk to last longer, cheese can be compared to wine for its complex characteristics. A product of high quality, just like with wine, must have a prime raw material and must follow a refined production process. The history of cheese is intertwined with the history of mankind, through the refinement of agricultural techniques and mostly to man’s ability to tame and breed cattle, sheep, and goats. We find traces of sheep breeding back to the Greek islands and in Asia Minor , around 6000 B.C. After milking these animals, our ancestors preserved milk, but unfortunately it would spoil quickly, so they had to create ways to make it last longer…and here cheese comes into play, born out of chance and a bit of genius. Through the centuries the art of dairy has developed and refined itself (and Italy is a leader in this development), but the basic elements have remained the same: milk, salt, heat, and curd. By law the denomination of cheese is given to the product that is obtained from whole milk or partially skimmed milk, or cream according to the coagulation and use of ferments and salt. Cheese is apparently a simple product but is actually comprised of many, many secrets. Let’s discover some of the virtues of many cheeses that are commonly found on our tables. 1. Milk storage (raw buffalo milk is stored in big steel containers). 2. Milk heating (thermal treatment of the liquid, then poured into a cream separator). 3. Curdling (by induction of natural whey). 4. Curd maturation (the curd lies in tubs in order to reduce the acidification processes). 5. Spinning (hot water is poured out on the curd in order to soften it). 6. Shaping (with special rotating shaper machines). 7. Cooling (by immersion in cold water). 8. Pickling (by immersion in pickling tubs containing the original whey). 9. Packaging (in special films cut as bags or in small basins and plastic. Many say the best way to eat mozzarella is in the so-called caprese salad, a simple salad of sliced fresh mozzarella, plum tomatoes and basil. Robiola – This cheese owes its name to rind that used to be red. It is a soft cheese with a faint perfume of truffles. It is made with varying proportions of cow, goat and sheep milk. Varieties of Robiola are produced across Piedmont from the provinces of Cuneo, Asti and Alessandria and into Lombardy. The taste and appearance of Robiola varies depending upon where it was produced. The most famous is Robiola di Roccaverano DOP (protected designation of origin), which has no rind and a slightly straw-yellow coloring with a sweet, yielding taste. 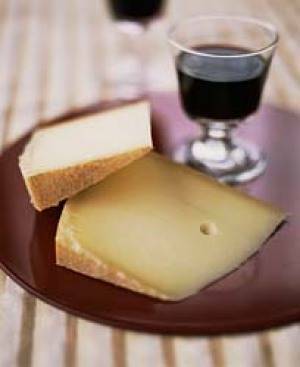 Robiola is generally served as a table cheese, either alone or with oil, salt and pepper. Ricotta - The name ricotta means "cooked again" ("re-cooked") in Italian, referring to the second processing of the liquid to produce the cheese. The main ingredient of this cheese is whey (a by-product of milk cheese making), rather than milk. When fresh, it is creamy and slightly sweet, with a finely grained texture and a pure white color. Ricotta is a favorite ingredient of many Italian desserts, such as cannolis. It is also available salted, baked or smoked. Mascarpone - Hailing from Lombardy , mascarpone is a buttery-rich double cream to triple-cream cheese made from cow's milk. The name form the Lombard word mascarpia refers to cream of milk. It is a delicate and pleasant flavor. It is good by itself, in sweets and with fresh fruit. Gorgonzola – This blue-veined delicacy is made from whole un-skimmed cow's milk. It can be buttery or firm, crumbly and quite salty, with a 'bite' from its blue veining. The name comes from Gorgonzola, a small town near Milan, where the cheese was first made. Gorgonzola is typically aged for three to four months. The length of the aging process determines the consistency of the cheese. It is great with polenta, risottos, pizza, but it is said to go best with pears. Stracchino – This is a soft cheese that also comes from Lombardy . It is eaten very young, has a soft, creamy texture and normally a mild and delicate flavor. The name of the cheese comes from the Italian word stracca, meaning tired. It is said that the milk from tired cows is richer in fats and more acidic. The best way to eat it is in a simple sandwich. But this is just the beginning. There are so many cheeses in Italy that they cannot all fit into one article. Grana Padano and Parmigiano Reggiano, for example, deserve a page of their own.